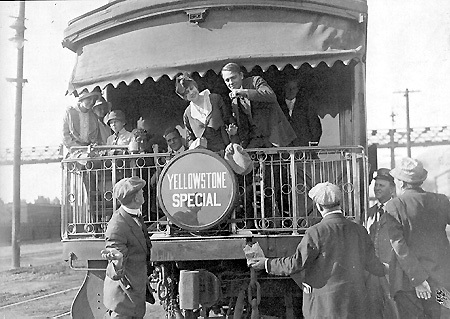 Mignon Anderson (L) and Morris Foster (R), married in real life as well as in these roles from A Yellowstone Honeymoon, are seen waving from the rear platform of a train. Thanhouser Career Synopsis: J. Morris Foster appeared in many Thanhouser films circa 1914-1916 and was among the companys best known players. He was married to Thanhouser actress Mignon Anderson. Biographical Notes: Born in Pennsylvania on September 9, 1881, J. Morris Foster was educated at Stanford University in Palo Alto, California. He began his dramatic career in 1903 at the Central Theatre, San Francisco, where, according to a news article, he was associated with Lawrence Griffith (stage name of D.W. Griffith). Later, he was at the Cort Theatre, Wheeling, West Virginia, where he played on the stage opposite Marguerite Snow and was spotted by Edwin Thanhouser, who made his acquaintance, a meeting that would later prove valuable to both parties. Foster was also associated with the Forepaugh company in Indianapolis and the Harry Davis company in Pittsburgh. He traveled for a season with Henrietta Crosman, after which he was seen with Olive Wyndham in What Happened to Mary. Other notable productions in his stage career included performances in The Merchant of Venice and The Sixth Commandment, with the latter in 1912 as part of a traveling company headed by Lillian Rhodes and Ernest C. Warde. A Sketch of His Early Career: In The New Rochelle Pioneer, October 17, 1914, John William Kellette told of Fosters early career: "Morris Foster is the original 'all to the merry kid, and hes 18 karat fine (22 would make him perfect and a man couldnt stand for that), but the 18 karat allows for just a little bit of the alloy of imperfection, and that makes him 'a regular fellow. 'Morry has been with the Thanhouser since the first of January, and all that time he has lived in New Rochelle in the vicinity of the studio, but to the New Rochelleans hes met he has been taken into full brotherhood. Just now hes riding one of the goats in one of the oldest organizations in the world with representation in 'The City Beautiful, and by the time this appears in print he may be a full fledged member. "Professionally Foster is aged. He doesnt look it, though, because he started it young. Back in 1901 he began his legitimate career with the famous San Francisco (Cal.) Stock Co. at the Central Theatre. Morriss future had been grooved to run into medical lines until he happened to come across that old classic - 'Throw physic to the dogs. To the dogs, the physic went. Then Morry fairly absorbed Shakespeare. He roamed around the back yards in the vicinity of the Golden Gate, eyes heavenward, 'lamping back porches in quest of a 'Juliet to whom he could pour out his adorations of 'Romeo, and history relates that hes been chased with shotguns by irate fathers who believed Morry was ranting elopement instead of theatrics. But when the youthful Barrett was stung by the thespian insect, Morry became a 'bug. His 1901 engagement was the result. "In 1902 he was leading man for Lansing Rowan in her revivals of The Young Mrs. Winthrop, Camille, La Tosca and Fedora. In 1903 he went to the Grand Opera House in Los Angeles, but 1904 found him burning with the desire to teach the young how to shoot and he opened a theatrical school. It was all off in 1905, because he returned to the stage in the production of Augustin Dalys A Night Off. Success bore him onward and finally landed him in New York City, at the 48th Street Theatre, in 1913-14, in What Happened to Mary, until the late Charles Jackson Hite engaged him to play leads. On the screen he has done great work. Hell continue to do so." On the Screen: An advertisement in The Moving Picture World, February 28, 1914, stated that his initial Thanhouser role was in Their Best Friend, released on February 27th. For the New Rochelle studio he acted in many productions, including Richelieu, Deborah, Gods Witness, The Bubbles in the Glass, In the Name of the Law, and Through the Enemys Lines, to cite a few which he in later years considered to be memorable. A 1914 biographical sketch noted: "Since being with the Thanhouser company, Mr. Foster estimates that he has stolen 57 varieties of wives from their husbands - on the screen, of course." New Rochelle directories indicate that in 1914 he lived at the Pepperday Inn, less than a block away from the Thanhouser studio, and in 1915 in Beacon Hall, an apartment building next to the studio. In April 1915 he married Mignon Anderson, one of the leading ladies at the Thanhouser studio. The couple honeymooned in Jacksonville, Florida, and reported back to work at the studio on Monday, April 26th. Their marriage was a love match, and the couple remained close until Fosters death. Later, he went to Famous Players, where he appeared in The Innocent Lie (May 1916) and other films. Morris Foster was in several Gold Seal (Universal) releases in 1917, including The Young Patriot, The Storm Woman and The Taming of Lucy. In the 1918 edition of the Motion Picture Studio Directory his mailing address was given as the Friars Club, New York City. In 1919 he was in the Paramount release of You Never Saw Such a Girl. He appeared in many other productions through 1920. A contemporary description noted that he was of medium complexion and had blue eyes. He considered himself an all-around athlete and enjoyed the hobby of raising fancy pigeons. J. Morris Foster died in Burbank, California on April 24, 1966. His ashes were deposited at the Forest Lawn Cemetery. He was survived by his widow, Mignon Anderson.